The house at the top is the house I grew up in in Virginia, and the one my parents still live in today. When I was in Baltimore, my sister drove me by the houses at the bottom in a neighborhood near her. We had heard that our house was from a kit sold by Sears, but still - running across these houses really made us stop. There more we stared at them, the more we could see little details that are the same as the house we grew up in. Ours seems to be a slightly larger version with some minor changes, but the similarities are still striking. I did some digging online and found an ad for the Sears Modern Home called the "Glen Falls" - the ritziest from their 1926 catalog. It sure looks like our house to me. In the early 1900s, Sears sold kits by mail order for homes that included everything you needed to build a home - lumber pre-cut and numbered, nails, doorknobs - everything but someone to put it together. You ordered them from a catalog and they usually arrived by train in a boxcar. Sears is thought to have sold anywhere from 50 to 100,000 of their homes, which came in models ranging from the Dutch Colonial like ours, to Craftsman bungalows, Queen Annes and Cape Cods. Over time, Sears became more involved in the mortgaging of homes, which eventually led to the downfall of that business after the Depression led to home foreclosures. 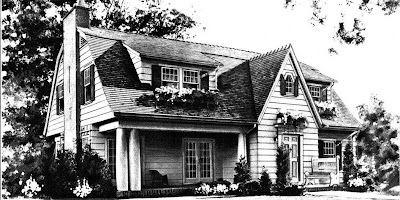 Sears sold their last mail-order homes in 1940. Ours still stands, and from looking at pictures of others offered by Sears, I wouldn't be surprised if many in our neighborhood came from the same source.